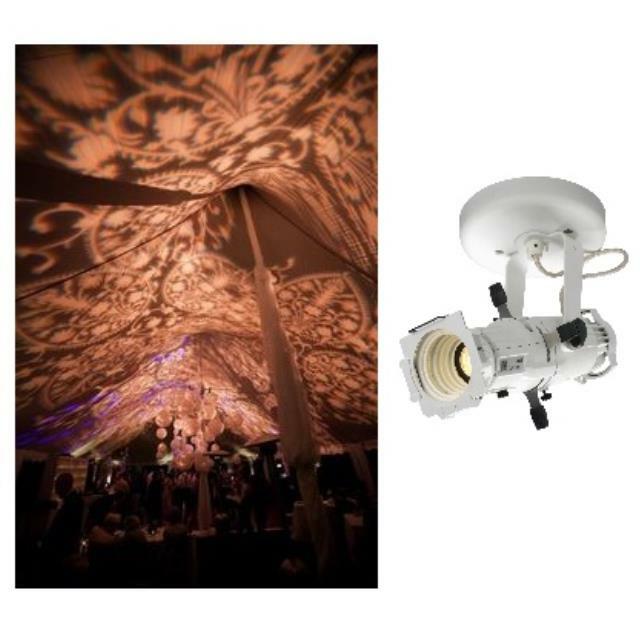 Depending on the amount of space and design needed, multiple Gobo lights may be needed. This picture requires 6-8 Gobo lights. Good things come in small packages. The Source Four Mini is everything you expect from the Source Four brand ease of use, superior optics, crystal-clear image projection and a bright, even field but packaged in a tiny fixture that s just one-tenth the size of a traditional Source Four. A mere nine inches long, the 50-watt Source Four Mini can go anywhere: museums, retail outlets, restaurants, light labs, children s theaters and other small-scale installations where size matters. The Source Four Mini is available in 50 , with a 2.5-inch diameter lens. It comes in a portable version with a miniature C-clamp or a canopy-mount design with an integral transformer, and a track-mounted design will be released this summer. All Source Four Mini models include an E-sized pattern holder and a gel media frame, with a range of additional accessories. * Please call us for any questions on our gobo led source four mini white rentals in Shreveport and Bossier City, Louisiana.